Air Duct Cleaning - Mark's Cleaning Service - Mark's Cleaning Service Inc.
﻿Call Today For A Free Air Duct Cleaning Estimate! ​Mark’s Cleaning Service specializes in air duct cleaning and other services to remove dirt, dust, and pollens from your home. Fresh clean air is essential to any healthy home as the average person spends approximately 87% of their time indoors. Air duct systems circulate hot or cold air throughout your home, but over time will accumulate dirt and debris. Our thorough air duct cleaning process remedies your HVAC Duct System of dust, soils, dirt & pollen also raising efficiency levels of your HVAC. "Is the Air You Breathe Clean? Let Us Check!" Our goal is to create a friendly customer experience in all ways. From when we meet for a free consultation to when our technicians are packing their trucks, leaving your home. We use state of the art equipment to inspect and clean your ducts to assure we can do the job right the first time. Our live staff members will guide you through every step, we are always happy to review or explain any of our cleaning processes. We offer FREE no-obligation estimates so you will have peace of mind knowing your quote is exact. Indoor air pollution is a growing public health hazard with negative effects on millions of people around the globe. Research shows that it contributes to more than half of all illnesses including sinusitis, allergic rhinitis, asthma and more. 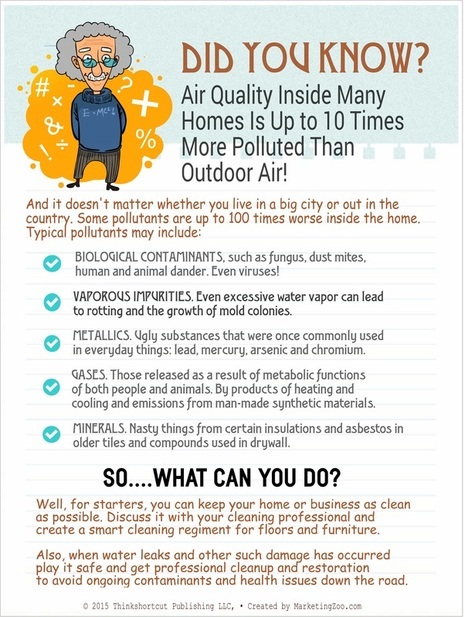 Common indoor pollutants include dust, mold, pollen, rodent/insect remains and feces. The average person spends approximately 90% of their time indoors, where pollutant levels are often two to five times higher than outdoors. The EPA has ranked indoor air pollution among the top five environmental risks to public health (U.S. EPA, 1987; U.S. EPA, 1990). ​Mark's Cleaning Service can give you peace of mind. We don't just clean air ducts, we also restore heating and air conditioning systems to superior cleanliness. We're here to help. Do You Ever Wonder Why Just A Few Days After Dusting Your Home, Dust Reappears? It Could Be Coming From Your Air Ducts. Whenever The Heater Or Air Conditioner Is On, All This Ends Up Being Blown Into Your House - And You Don't Want That. "Make Sure The Air You Breath Is Clean!" Your indoor air quality may be related to irritants found within your heating and cooling system. Our process will rid your ducts of common elements found within air ducts like pet dander, dirt, pollen, dead insects and rodent feces. All of these irritants listed are carried through your home whenever you turn on the heater or air conditioner. Cleaning your entire HVAC (Heating, ventilating and air conditioning) system by our highly trained technicians will help eliminate these harmful irritants from your home. Our state of the art equipment removes all dirt and debris from the walls of your air ducts. How do we do this? We simultaneously blast compressed air all along the walls of your ducts as a truck mounted high vacuum pulls the irritants to our trucks for safe disposal. Mark’s Cleaning Service Certified technicians are continually attending seminars and conferences in our industries, using the latest technology and equipment. Our technicians are always careful around landscaping and inside the home and office areas they will be mindful of the woodwork while cleaning Air Ducts throughout your home. We have a 5,000 square foot facility, and our door is always open to meet with our clients. ﻿Call Today For A Free Duct Cleaning Estimate! RamAir is a revolutionary duct cleaning process that allows for state-of-the-art forced air cleaning with no mess or debris. It tackles indoor air pollution without harming duct surfaces! The patented RamAir ClearView Duct Cleaning System is the most effective system to date, as well as the first system ever created that allows the homeowner to actually see all the dust and debris as it is being removed from the duct system by way of a clear polycarbonate viewing box. This revolutionary new system has been quickly gaining recognition and praise worldwide. LET US CLEAN YOUR DUCTS TODAY!